Microsoft has unveiled its EU-mandated Web browser choice screen, and will start rolling it out next week. Redmond's deputy general counsel Dave Heiner warned Explorer users "what to expect", in a not at all grudging blog posting. He said the design and operation of the screen "was worked out in the course of extensive discussions with the Commission and is reflected in the commitment that Microsoft made." The UK, Belgium and France will get the first crack at the screen, which will be rolled out through Windows update to users who are running Explorer as their default browser. A phased roll-out to the rest of Europe will begin from March 1. Windows 7 users will have IE automatically "unpinned" from their task bars as part of the process. 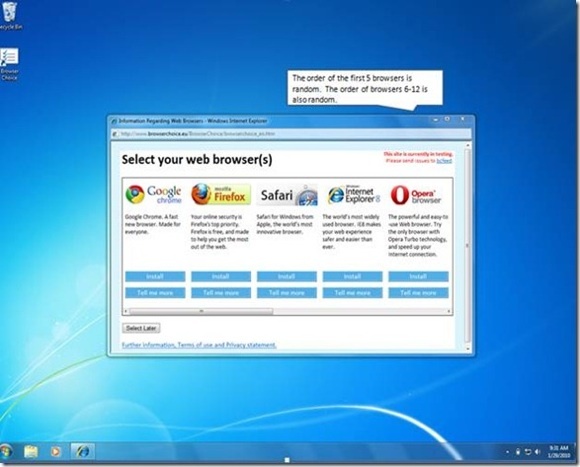 At the same time, users will get a screen warning that they have "an important choice to make", before getting the following list of what Microsoft describes as "leading browsers". Uses who realise that yes, they've already wanted to try something other than Explorer but were afraid to ask, can click for more info or just go crazy and install Opera or Chrome or whatever there and then. The process seems relatively straightforward. But even so it illustrates the problem with the issue.